One of things that I think I mentioned in my last blog about #CES2014 was that wireless speakers were all over the place! Well, I finally got my first one to try out from Eton Corporation – the Rugged Rukus. It’s a cute, durable, wireless, solar-powered, bluetooth speaker! Though it’s a tiny speaker, it packs a good wee punch! Plus it works with all my devices – the iPod, my Nokia Lumia, the MacBook, and I just watched a little Grey’s Anatomy on my Kindle Fire with it on too! Anything with Bluetooth. 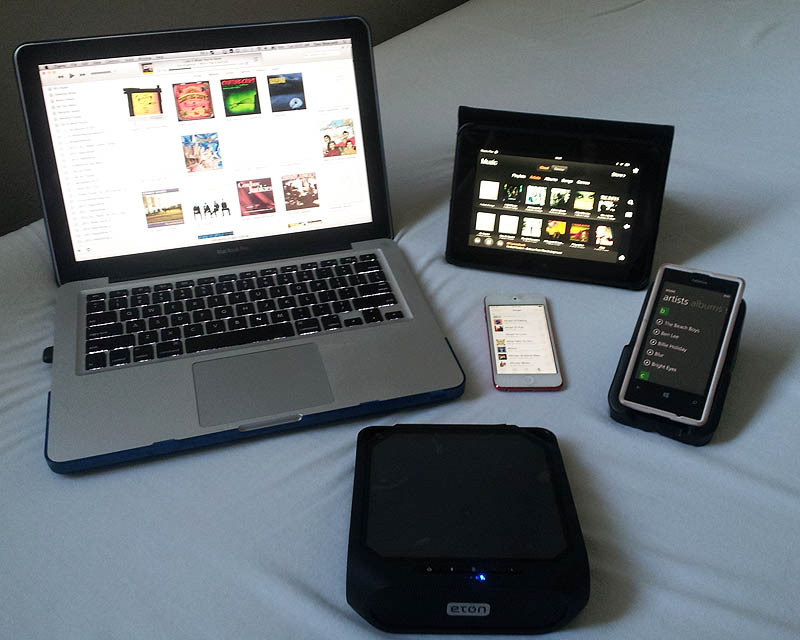 In addition to it playing all my music across my various devices (incidentally my Amazon cloud currently at over 41,500 songs!) – it can also charge my smartphones or iPad or anything else in the above picture (except the Macbook of course – that needs too much juice!). I just love I can take this guy into the bathroom while I shower, or into the kitchen with me while I cook. It’s so rugged (hence the name) that it could go out when hiking, at the beach or poolside (can you say “Splashproof?”) or wherever you are outdoors. As I tend to be really hard on my tech – I love the durability aspect of this. The one thing I was most curious about – given that it’s a solar machine – “will it work in Glasgow?” That was the first question I asked John Smith (Eton’s VP). Well, luckily for me, it works even in the less-than-sunny climbes like Glasgow! So suffice it to say, I am delighted with this little guy. 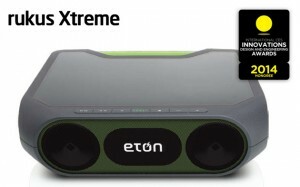 At #CES2014, Eton launched a few new products – but the one I am most excited about is the new Rukus – Xtreme! 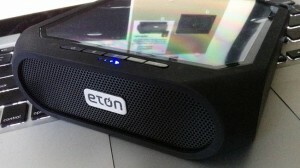 It got some rave reviews at CES – you can see more on the Eton Blog. They won an innovation award for this new one – due out later this quarter and I for one can’t wait! In case you’re wondering, no I don’t work for Eton, nor am I being “paid” for this raving blog! I did however get a demo device to play with, and couldn’t help but rave about it. Let’s face it, we all have too many wires these days. Anything that cuts down on my wired devices – in or out of my home – is a good thing! I look forward to taking the Xtreme to the EXTREME when it comes out! Watch this space!